Hunting wind trends can be a very accurate way to hunt deer. Using technology like GPS can record wind speed and wind direction. I prefer to use a more accurate form of recording the wind variables and that is a home wireless weather station. They are simple to setup and can be plugged directly into your computer with software that records the environment variables. The following picture shows the output of a program called heavy weather from a home hunting weather station I own by La Crosse. 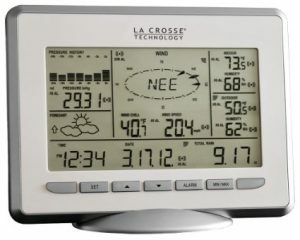 The program fetches the data from the weather station receiver and imports the concise data into the software program. This data can then be imported into programs like excel and you can configure out wind trends by weekly or bimonthly. After you get a significant amount of data it can be compared bi-yearly. You can guesstimate with the data and prepare a strategy for hunting wind trends. The variables a hunting weather station can record are unlimited as far as what a local weather station can give you but the biggest factor that has me hooked on using a home weather station one is the data is relevant to the area and terrain I hunt. A local weather station could be up to one hundred miles away, not only can the temperature vary greatly within a hundred miles but the wind direction could be off as well as barometric pressure. Simply put yes you can track strong prevalent winds but if you live at a different elevation the wind direction can be ever changing. So the home weather station plays the optimal role, they give us data relevant to the places we hunt. As you can gather this information is very useful when looking for patterns over time. They can and will decide which area to hunt on what day and hopefully what time to hunt. The more information we have beforehand the more of an edge we can get on the bucks we hunt. We then can concentrate on other aspects of the hunt like target practicing instead of trying to figure out why the wind does not work to your advantage. The great part about it is that watching for weather patterns can be a year-round activity whether it is showing your kids how you track deer with the wind or for personal enjoyment. The price of a portable hunting weather station can set you back from anywhere to $50.00 to 5,000 dollars depending on how accurate you need the device to be. Not only can these devices track wind direction but barometric pressure as well. It is widely known that animals will change their feeding and movement pattern to the barometric pressure. With that good luck hunting and see you next time.